A wild cat of South America, Pampas Cat bears a close physical resemblance to the European Wild Cat. 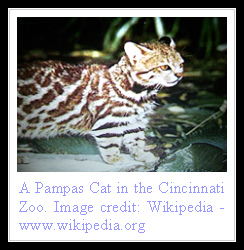 About the size of a large stocky house cat, the Pampas Cat, also known as Grass Cat, grows up to three feet in length including its one foot tail and stands a foot tall at the shoulders. Weight is around ten pounds. With a broad face and pointed ears, Pampas Cat has quite diverse coloration in different parts of its range. Fur length varies as does the color, ranging from red to yellow and gray with a variety of spots and stripes on the body. Nose is pink and brownish bars run across face and upper forelegs. Melanistic individuals have been recorded. Ears are gray on the back and have a central white spot in the cats living in northern parts in contrast to the southern dwelling felines which have plain ears. A small mane runs across its back and this along with the somewhat bushy tail gets erect to make the cat look bigger when it feels threatened. A predominantly nocturnal felid, Pampas Cat prefers moist jungles and open plains of Patagonia, residing at times at high altitudes. It preys upon small animals including rodents, birds including pigeons as well as domestic poultry in areas where human settlements are close by. Leopardus Pajeros, it is believed to be predominantly a terrestrial hunter. Pampas Cats come into estrus halfway into the year, in the months of May, June and give birth to a small litter of two kittens on average after a pregnancy lasting nearly eighty days. Maturity is reached at around twenty one months. Longevity in captivity is known to be up to sixteen years, though the average lifespan is about half of this. Heavily hunted in the 1970's for its fur, the Pampas Cat is now protected as a species and pelt trade is illegal, allowing the cat to reach the current status of Least Concern even as habitat and prey loss continue to take a toll on this beautiful feline. Wild cat of South America is looking good.Its unbelievable that this cute is so dangerous.Its a great news that the Pampas Cat is now protected as a specie and pelt trade is illegal. this doesnt help! i need survival skills! I am certain this post has offered me some assistance with saving numerous hours of perusing other related presents just on find what I was searching for. Much obliged!